We will be working on several try-its this year. Most will take a few meetings to complete. Some Try-Its will take all year to complete because they involve activities during the fall, winter and spring. Along with working on our Try-It Badges, the Brownies can receive fun patches to remember the activities they've done. Requirements for Animals completed on 4/8/2008. Try-It awarded on 4/22/2008. Animals – We will explore the world of animals. We will do activities to learn about caring for pets, understanding animals, how they move, and the how they communicate. As part of this badge, we will tour the a veterinary office and animal hospital. Requirements for Colors & Shapes completed and awarded on 2/12/2008. Colors & Shapes – We will learn how Artists use colors, lines, and shapes to make art. The girls will develop their creativity with activities of making their own stencil stamps, dough shapes, weaving color patterns and yarn painting. Requirements for Cookies Count completed on 12/18/2007, Try-It awarded 2/12/2008. Cookies Count – This will be our first year to sell Girl Scout Cookies. We will have a meeting dedicated to learning what’s involved – how to use good manners, being a good friend and neighbor, improving math & money skills, and practicing what to say to a customer. The girls will decide where to donate some of the money they earn, and what reward or special activity they would like to use with their cookie money. Requirements for Earth is our home completed on 4/11/2008. Try It awarded 4/22/2008. Earth is Our Home – Living things like people, plants, and animals make their home on our planet. We will work on activities though the year that focus on how we can make our home a better place. Our activities include collecting items to make our own mini-world terrarium in the fall. In the winter, we will make draft stoppers to keep cold air out. In the spring, we will make natural cleaning products and participate in the town's clean-up day. All activities for Girl Scout Ways completed on 10/23/2007, Try-It awarded 12/11/2007. Girl Scout Ways – We will start of the year by learning more about being a part of this very special group of people. We will learn some of the things Girl Scouts everywhere know. We will create our Kaper (responsibility) chart that we will use at every meeting. We will also create our own sit-upons to use at meetings. We will review the Girl Scout Law & Promise and make our own troop book about the Law. The Girl Scouting’s mottos is “Be Prepared!” We will prepare for our first day-hike outing by creating a first-aid kit for our troop. All activities for Movers completed on 5/20/2008. Awarded on 6/10/2008. Movers – The wind can create a gentle breeze or make a powerful hurricane. We will do activities that use the wind to have fun, including making paper copters, pinwheels, windsocks and a troop kite. We will walk to the park to try out our flyers. All activities for Outdoor Adventurer completed on 5/18/2008. Awarded on 6/10/2008. Outdoor Adventurer – Outdoor activities are a special part of being a Brownie Girl Scout. We will go for a day-hike in the fall and learn about the outside world using all of our senses. We will play dress for the weather games in the winter and we will sleep out in tents in the spring. Our Brownies will receive these fun patches for participating in our activities during the year. Patches are to be placed on the back of the Brownie vest. First Aid patch provided at meeting on 10/23/2007. First Aid – The girls will earn this patch for “Being Prepared” and creating our troop’s First Aid kit. Calendar patch awarded on 12/11/2007. Calendar Sale – A Brownie will earn this patch if she sells 5 calendars during the fall calendar sales program. Backyard Camping patch provided at campout on 5/18/2008. Backyard Camping – The girls will get this patch after our camp out in the spring. 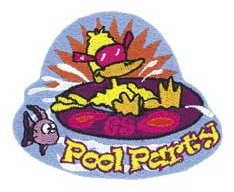 Pool Party patch provided on 6/10/2008. Pool Party – The girls will get this patch at our end-of-year swimming party. Star Performer patch awarded on 2/12/2008. 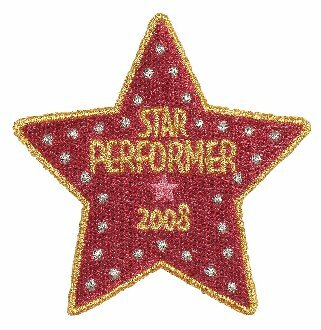 Star Performer - This patch will be awarded to any girl scout that sells 150 or more boxes of cookies during our initial order period in January. Vet Tour patch provided at meeting on 2/26/2008. Vet Tour – The girls will receive this fun patch after touring the Veterinary and Animal hospital. Graphic images used on this site are the property of Girl Scouts of the USA. For use, copyright information, and terms and conditions, consult the GSA web site. Brownie Girl Scout on this page courtesy of Brownie Troop 107 of Long Beach, CA.